It’s the fairytale dream of almost every woman from a young age, to look just like a princess on their wedding day. As one of the biggest days of your life, it’s acceptable to flaunt a little bit of opulence and nobody does this in a more tasteful way than the Royal Family. Not only do you want to feel good, you also want to look amazing for the photo album that you’ll cherish forever. With access to some of the most delicately crafted, luxurious pieces, the style of the Royal Family is certainly one to emulate when you’re planning your wedding outfit. They say diamonds are a girl’s best friend, but limiting yourself to one precious gemstone restricts you from a world of wondrous sparkle. Ruby and sapphire stones are a popular choice amongst royals who want to add a splash of colour. Once owned by Princess Diana, the engagement ring worn by Kate Middleton featured a gorgeous blue sapphire. Sitting on top of a white gold band, the gorgeous stone was surrounded by smaller clear diamonds. This stunning ring opened our eyes to choices of precious stones we may not have immediately considered. Opal, amethyst and the red hue of ruby offers a sophisticated alternative to the classic diamond sparkle. Adding a subtle touch of elegance to any outfit, brooches are a rare sight these days and have a simple vintage charm about them. The most opulent collection of these divine accessories has to be held by the Queen. Her Williamson brooch features what has been described as one of the finest diamonds in existence, which was found in October 1947 at the Mwadui mine in Tanganyika. It was gifted to her by Canadian geologist and royalist Dr John Thorburn Williamson. Brooches are an easy way to incorporate ‘something old, something new, something borrowed and something blue’. Perhaps if you don’t have a brooch in your family to borrow, you could treat yourself to a new delicately designed piece. Find one adorned with blue sapphires and you’ll be able to check two boxes with one item. There aren’t many occasions that you’ll be able to wear something as magnificent as a fascinator. Although they don’t have the luxury of jewellery, they do have the wow factor. One of their main attributes is the fact that many pieces are unique, as designers create bigger and bolder fascinators, pushing the boundaries of conventional fashion. Seen at some of the most glittering events, fascinators are reserved for special occasions only. 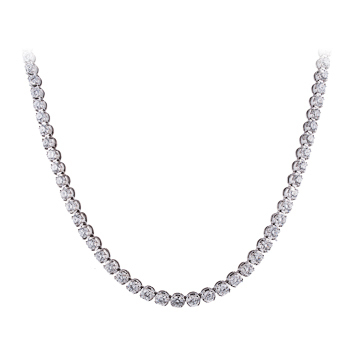 The key to finding the right necklace for your wedding day is to ensure it matches the neckline of your dress. Short chains and chokers work for higher up necklines and add a subtle touch of glamour without taking too much attention away from your carefully chosen gown. Try to avoid long heavy chains, as they will undoubtedly get in the way whilst you prepare yourself on your wedding day. They also pose the threat of being caught in the delicate material of your dress or veil. Whilst the memories of your wedding may fade, you’ll be able to look at your jewellery collection and relive the feeling of glamour you experienced on your big day. One day when your children grow old, you’ll be able to impart your wedding day wisdom and share your beautiful accessories when it’s their turn to walk down the aisle.